The sleek design of our over-the-pocket top grilles has become the most popular way to enhance the hood of the H2. These grilles feature 4 or 7 louvers, some of which run completely under each hood handle. The handles are solid billet aluminum, and include light-reflecting grooves for a distinctive look of quality. Adding a custom top grille kit from RealWheels is one of the best ways to begin setting your H2 apart from the crowd. Choose 4 or 7 Louver overlay design, then add pocket inserts and Hood Handle Overlay Strips. 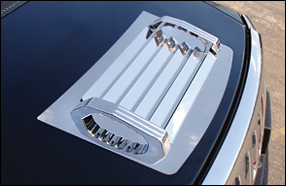 Or go all the way with are solid billet aluminum, triple chrome plated hood handles in either smooth or light-reflecting grooved.